The family that Halloweens together stays together. And every year, Beyoncé and Jay Z seem to come up with a costume idea that pays homage to the old school. Last year the couple's costumes were a tribute to Coming to America. 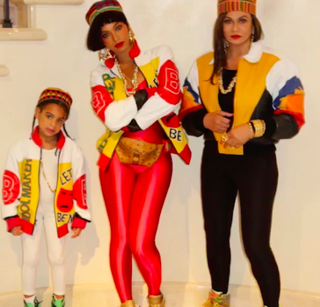 This year Beyoncé; her mother, Tina Knowles-Lawson; and Blue Ivy paid tribute to Salt-N-Pepa. Jay Z wasn't left out of the costume fun. We can only assume that with flip-up sunglasses and some ’90s clothing, he was dressed as Dwayne Wayne from A Different World.